Trust administration is the process of carrying out the wishes of Trustors expressed in the terms of the trust, typically upon the Trustors’ death. Depending on the type of trust that is originally created, and the size and composition of a particular estate, there is a different number of tasks that a Trustee has to perform upon to comply both with the terms of the trust and statutory requirements. As much as creation of a living trust streamlines estate administration, it by no means eliminates it. 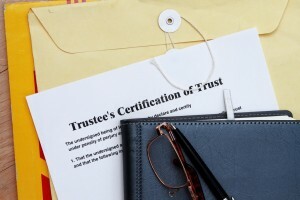 The amount of work involved in trust administration is often daunting and the process can be confusing, especially for Trustees who are not professional fiduciaries. Some trusts require division and re-titling of assets, some involve setting up additional trusts to be administered for the beneficiaries’ lifetime. Some simply involve transferring assets to a large number of beneficiaries. Furthermore, some of the tasks that Trustees are required to perform are universally applicable and are dictated by the Probate Code, such as providing notice of decedent’s death to beneficiaries and certain government entities. To make things more challenging, trust administration naturally takes place upon someone’s death, which is an emotional and trying time for the family members, who often happen to be named as Trustees. Whatever the situation may be, we work with Trustees to guide them step by step through the process of complying with the terms of a specific trust and universal statutory requirements. Each trust that we create includes a free consultation with the successor Trustee regarding trust administration. We strive to provide as much direction to the Trustees as possible to make their job easier and allow them to focus on their lives and families.